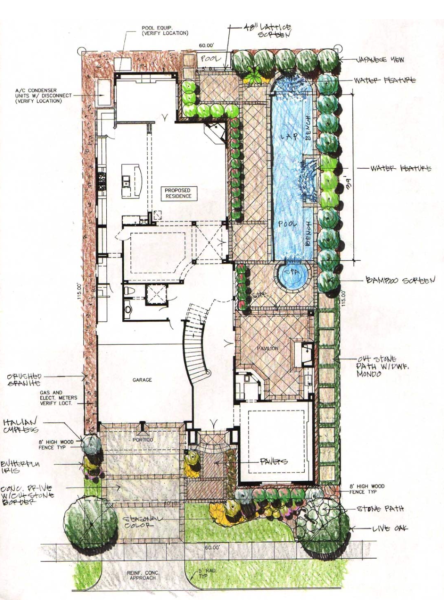 This is the first step that you take to design & build something unique on your property. Bob Atwood is a graduate from Oklahoma State University. He graduate d with a degree in Landscape Architecture, & horticulture. He has the experience, & the passion to design you a one of a kind landscape, patio, pool, or anything else that you can imagine. After the design, we can install it under the guidelines that he will provide. We can have structures design by a Engineer, as well. We use up to five inches of rose garden soil. We remove all the grass underneath the desired flower beds. I shop around for all my plants. I encourage customers to allow us to put in sprinklers to water the plants and trees. The mulch is organic to help keep the roots wet. The base is a combination of earth mixed with a lot of portland concrete mix. It is tamped down with plate compactors. Once, it is wet the base gets hard like a concrete patio. Then, the next layer is two inches of fine sharp sand to give the proper slope. The pavers are installed on top. We can design a drainage system in your yard that will carry out the water starting from low spots on your property. We can add a control box that will operate as many sprinkler heads that are needed. They are all low voltage to not drive up the electric bill. Remodel a pool. We can change out the tile or coping. Add a heater pump to keep it warm during the Winter. We can design a cover that will meet all your needs. It can either protect your from the rain, or a arbor that will protect you from the sun. A pond with a water fall combo is a beautiful thing to have. The sound will relax you, & the plants / fish adds something to look at. They did an excellent job. They did our landscape with trees, grass, sprinklers, & a beautiful pergola. They were always polite. I highly recommend them. They were great to work wiht from quote to finish. very willing to compete with another company and very honest about the process. no suprises. I immediately enjoyed how easy it was to contact them. they were very quick to respond to texts, and phone call. so far we love the space. ​SO, JUST GIVE US A CALL.